Nitrate-free Tamworth bacon is meant to be eaten uncooked. Frying your bacon is so passé. 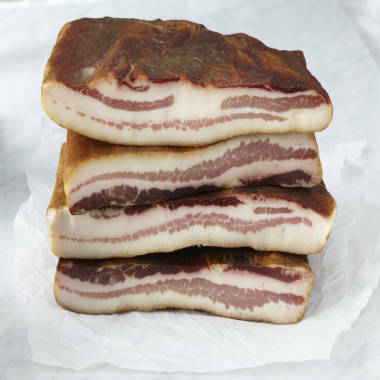 La Quercia caused quite the stir at this year’s Fancy Food Show in Washington, D.C., when it premiered its new Tamworth bacon. What was the big deal? Make that a raw deal – this bacon is meant to be eaten uncooked. The company uses pasture-raised, antibiotic-free Tamworth hogs (an English breed known as the “bacon pig”), grown especially for La Quercia over the last four years by a farm in Osage County, Missouri. The pork is cold-smoked using applewood and rubbed with sea salt and spices, with none of the nitrates you usually find in bacon. So, how does he eat it? What does Ben & Jerry think of bacon ice cream?